Very flavorly designed card. I love it! Mmh maybe I don’t understand what you’re saying, but his activated ability works on the battlefield not in the graveyard. I don’t think I understand either. There’s no interaction with GPG and this card. he wants to reanimate the cards that he discards with this effect. He also wants to swing for 7 with a GPG reanimated creature. So… yeah. Neither are all the pterosaurs we’ve seen thus far, but sometimes gameplay is more important than flavour. Making this a separate creature type would probably kill more gameplay implications than create ones. Well, that’s close enough to dinosaur for me! I ran out of upvotes for you, Dr. Crow. Marine reptiles and they are the reason I thought we wouldnt see blue primal, cuz there arent sea deep dinossaurs, there were all marine reptiles. That said, i think this and Etali are my favorites of the Elder Dinosaurs. Big swimmy boi, such a blue boi. Also the blink is pretty cool, like he dives away and comes back, nice 1. 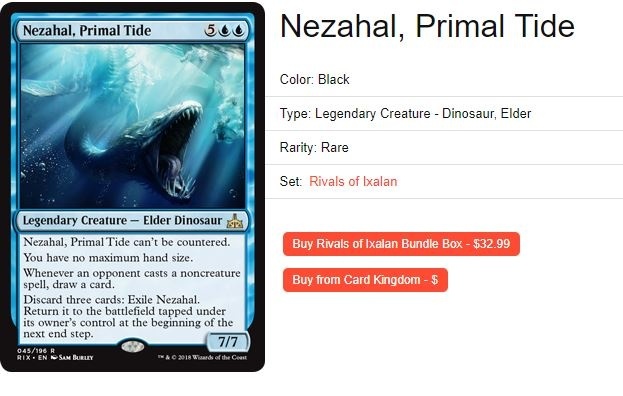 Here I was debating with some1 that there wouldnt be blue primal cuz no marine dinossaurs, was wrong, at least I did tell him if there was 1 it would be Name, Primal Tide XD So obvious how wizards brain works. this card is garbage,it will probably be the least played of the cycle. Seriously,the blink cost so much it’s not even funny,with 0 evasion,7 mana WITHOUT flash,so you can’t cast it before… turn 12? garbage. Sadly,scarab god/gearlhulk will remain the finisher of choice. Yeah i’m sure you want to play this turn 7 while your opponent spend 3 mana at the end of YOUR turn to kill it,and get to untap while you have literraly NO WAY TO COUNTER ANYTHING. Yeah you DID draw a card in the process,but your behind in board. “But you can flicker him!” yeah? then what ? you arent’ in card anymore,and he is GARBAGE if you don’t control the board, and you can’t because you just wasted 7 mana on your turn. It remind me of pearl lake ancient,but without flash it’s just not good enough. Just imagine if it had flash : you play it end of the opp’ turn,he kill it,you blink it (rip card.. -2 CA) but you untap,he come back, opp will (probably) not have enough mana to (try) to kill it again,but if he can, just counter it,and you drew a card in the process (-CA) and get to swing. Perfect finisher. I was speaking for EDH…A commander with dodge, uncounterable, and gives you draw is perfect for a slow blue supression deck. And Spire Winder is a snake while Majestic Heliopterus is ofc, a dino.